Step one: Confront the noise. From the bottom, when you actually make it to the top, you look down and you realize how high up you are. That perspective can be very scary. is because we’ve never been in a position to fall that far before. So I stood at the edge of this bridge, peering down at the distance between my feet and the river’s surface. Looking at a distance I’d never plunged before…and I backed away. The butterflies in my stomach flew in excuses that told me how nonsensical an idea this was. They showed me every reason they could find to keep me from taking the big jump. Today wasn’t Excuse’s day to triumph. I wanted it too much today. I wanted to overcome my fear of plunging from an unprecedented height more than I wanted to take the same safe shallow plunges I’d known all my life. The ones that made smaller splashes. The ones that didn’t sting so much when you landed the wrong way. So, back to the bridge’s edge I went, nervous and anxious. With my feet curled over the ledge, the guardians of change began singing their chorus again, but no serenade of fear and smallness was going to stop me today. The onlookers stared and pointed, engrossed with whether I was going to take the big jump or not. First, I tried a running approach. I stopped at the edge. That was a bit too ambitious for now. Maybe two steps and a leap. That didn’t work either. I needed to see what I was jumping into. Everything that flies eventually falls back to the Earth. What I felt on the way down was incredible. It was a sensation I’d never experienced before in my shallower plunges. Initially, when you jump from that high a place it feels like any other jump. There’s a rush of “whoa” and not enough butterflies to really call it butterflies. But as you pass the point of your normal, shallower plunges, you begin to feel your body… stretch. You know you are jumping from higher heights when you feel yourself stretch. That first big jump wasn’t to be my last. It was just the beginning in fact. Four jumps later I was attempting to do twisting somersaults on the way down. I had gone from an observer on the sides who feared the fall, to a participator who was learning to fall with style. 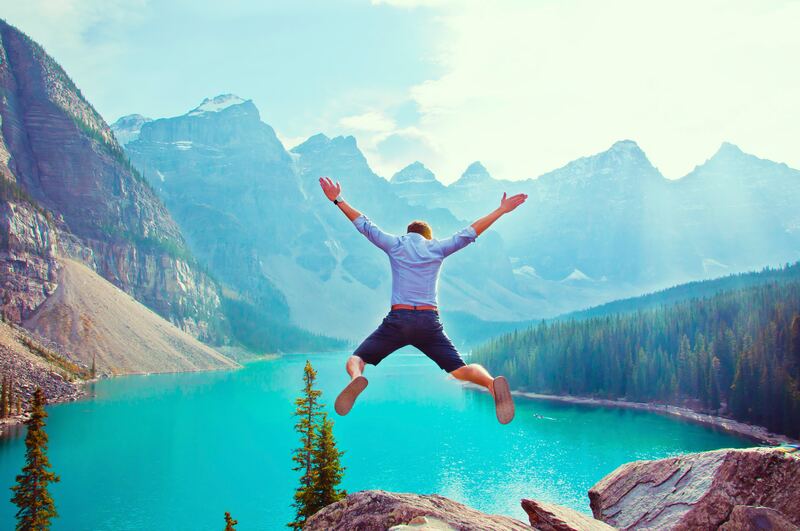 When you overcome the fear of the fall, you can enjoy the elation of higher heights. Falling is an inevitability of evolving. Just as much as flying. It’s why we’re here! And how you respond to your falls will determine how powerfully you fly. So are you ready to take another Big Jump with me? FIRST, CONFRONT THE NOISE. The noise is the old stories, the limiting thoughts that don’t reflect the way we see ourselves; that hold us back from expanding and bettering ourselves. When we want to be a model, they tell us we’re not the right size. When we want more wealth, they tell us how hard and unlikely that will be. When we want a loving partner they tell us that we’re too different or difficult to be with anyone. When we want to jump off a perfectly functioning 20-foot bridge, they tell us how scary and pointless that is! And that’s okay. In fact, it’s great to hear the old stories because they tell us who we currently are and what we truly believe about ourselves at the moment. That helps us tremendously with our next step! The NEXT step is to CHANGE THE STORY. Once we know what our old stories are (by listening to the limiting thoughts) we can begin writing our new stories. We don’t have to erase the old ones, We don’t have to do anything to them at all. All we have to do is ask ourselves: What does my most Successful Self look like? What makes me feel happy and full as my Successful Self? What feelings or sensations do I experience as my Successful Self? Who are my friends, where do I live, what do I eat as my most Successful Self? Let’s make a list. This is our time to let our imagination run wild. And as you write the details of your new stories- of your new YOU- ask the question why. Why do you want to feel this way or have that thing? This shows us the core feelings we actually desire and sets us up for the last step! The LAST Step is to JUMP! Now! We can start living our new story… right now! We don’t have to wait. If our old story was that we couldn’t swim or that jumping off bridges was pointless, the new story is that we’re an Olympic level swimmer and that jumping off bridges is exhilarating! So what do we need to do to get there? Better our fitness? Increase our lung capacity? Learn the mechanics of swimming? Okay! We’ll start running in the morning, or jogging, or walking- whatever is more than now. We’ll start remembering to breathe deeper, and to hold our breath longer throughout the day. Don’t have a pool? No problem. We’ll imagine being in one, and do the movements as if we were in a pool. The point here is that we can begin LIVING our new story whenever we want. And once we take action, believe me, the Higher Power within us will respond and help us reach our goals! You’re going to fall and make a splash everyday becoming your Successful Self, so make sure you reach higher heights each time so the splashes become greater and greater as well. I write about the art of becoming your most authentic, emotionally brave, and successful self.